Pepperl+Fuchs: In the field of door, gate and elevator construction, Pepperl+Fuchs provides a comprehensive portfolio of high-performance sensors. In addition to the "RaDec" and "RMS" product families, the new RAVE radar motion detector supplements the radar sensor portfolio with an extremely robust model. With IP67 protection, the new motion detector functions as an ideal door opener for demanding automation tasks in harsh ambient conditions. The new RAVE radar motion detector makes an impression with its extremely robust housing with IP67 degree of protection. Thanks to this protection class, the opening impulse sensor possesses a high level of immunity to rain, dust, and dirt as well as extreme temperature fluctuations. The RAVE is therefore the ideal sensor solution for harsh industrial environments. 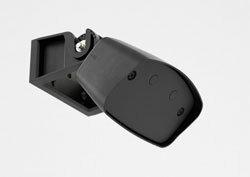 The installation concept of the RAVE radar motion detector consists of a bracket for easy mounting of the device and a detent for quick adjustment of the detection angle. The operating and switching status is always clearly visible via the display LEDs. Individual settings can be easily adjusted using the integrated push buttons or via remote control. The powerful RAVE is equipped with an extra-wide detection field. The radar motion detector enables cross-traffic suppression and has two relays that differentiate between person/vehicle detection in addition to opening the door depending on the situation. This allows traffic flows to be regulated, energy to be saved and processes to be optimized.